DKSH Myanmar held the first-ever charity run under the motto “Run and Contribute” to support a local cancer foundation. 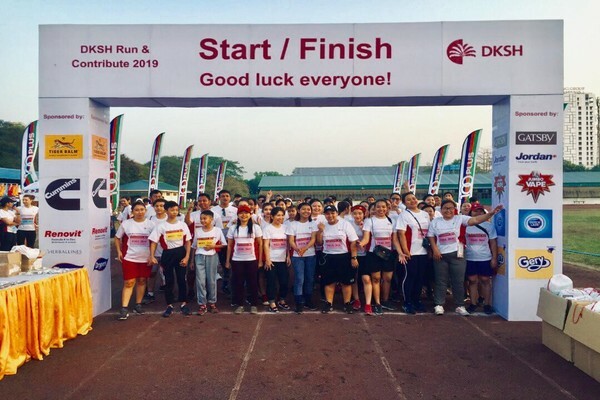 Yangon, March 26, 2019 – DKSH Myanmar, a leading Marketing Expansion Services provider in Myanmar, held its very first running event. The “Run and Contribute” marathon promoted a healthy lifestyle, created awareness for cancer and contributed to a local cancer foundation. The event took place at Kyike Ka San stadium in March 2019. Many clients, such as Tiger Balm, Gatsby, Renovit, Cummins, Jordan, Jumbo, Dutch Lady, Herballines, Gery and Drypers sponsored and supported the activity. Nearly 300 participants joined this event, children and adults alike. Three distances were available – three, five and eight kilometers, respectively. DKSH Myanmar donated 2,500,000 kyats to the Ministry of Health and Sports to provide resources, trusted information and support for every Myanmar citizen affected by cancer. “We are very proud to initiate this DKSH Myanmar ‘Run and Contribute’ marathon, which is the very first event of its kind since DKSH was established in Myanmar more than two decades ago. The main objective was to promote a consistent healthy lifestyle by running, while supporting the local cancer foundation. We are really delighted to contribute to the local community and support cancer victims. We also have plans to do these kinds of social activities more often in the future. We thank all participants for running for a good cause,” said Rajinder Grover, Vice President, Consumer Goods & Head Country Management, DKSH Myanmar.